Compared to other services on the road, Strensham sees less of a seasonal spike and is just busy all year round - good job all the old parts are gone and buried and two newer buildings are doing the job instead. Honestly, you should have seen what was there before. First two hours free for all vehicles, after which cars must pay £12 and HGVs, caravans and coaches £29, or £31 to include a £10 food voucher. Prices are paid using PayByPhone - more details or in the shop or restaurant. The location code is 5261 (northbound) and 5262 (southbound). 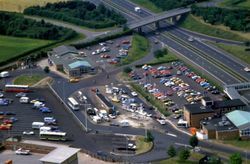 The original northbound services in 1981. The two sides of the services are about a mile apart. Originally the services were built just like any other, if a little close to M5 J8. However, the original set-up has been removed completely, as explained in its history. The northbound site has an air ambulance base which was built in 1998. A Leon opened on the southbound side in early August 2017. The northbound filling station is operated by Euro Garages and the southbound filling station is operated by BP. The northbound filling station used to be operated by Roadchef themselves but was sold to Euro Garages in early 2018. In December 2017, the southbound services began to go through a £5 million refurbishment, with work starting on a new Spar and a new entrance to the southbound services in time for the summer season. The Spar store opened on Thursday 22 March 2018 with a Dolcetti Ice Cream counter inside. The McDonald's and Costa underwent refurbishment, and a flagship Boots store opened here on Thursday 29 March 2018 - the first on the motorway network for a while.